The week-long online workshop is free to WWFA members (Join here). 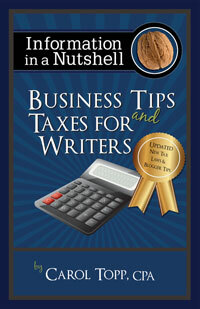 My workshop, titled Taxes for Writers is a pre-recorded video. It will be available over the weekend for members to view and post their questions. Then I will join the forum on Monday, April 27, 2015 to answer your questions. We know tax season just ended, but while taxes are on your mind, let’s get a better understanding of them for next year! Author and CPA, Carol Topp, claims she can explain federal income tax in clear English. Come hear her try! She will discuss tax deductions and special tax rules for authors and publishers. She’ll focus on federal income tax, but also explain the confusing laws surrounding sales tax and selling over the internet. Carol will also share record keeping tips to make your life easier. This workshop is loaded with examples to make your writing business less taxing.